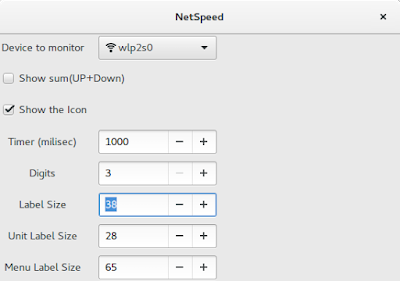 Do you need a realtime indicator showing upload/download speed in your GNOME Shell top panel? If so, then Netspeed is a right extension for you. It docks on your panel and showing current network traffic speed in numerical values continuously. It is basically similar with another extension such as Ping Indicator. Follow our instructions about installing any GNOME Shell extension. There are not much settings you need to do for Netspeed. But there are some parameters you can change. 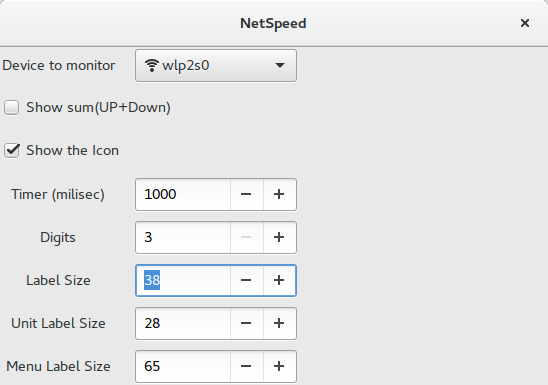 To open the settings window, click on the Netspeed item in top panel > click on the gear icon. You may also open it by using GNOME Tweak Tool. (1) Device: you may select the network interface, such as wlan0 for WLAN (wifi) or eth0 for LAN (cable). You may also select ALL to monitor all interfaces available if you run them all simultaneously. 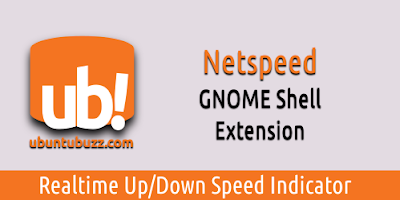 (2) Timer: by default, Netspeed gives 1 second (1000 ms) interval to run the network speed monitoring. You may change this interval to any number. (3) Change interface quickly: click the Netspeed item on the top panel > a new popup shows > select one interface from the list. This is better if you have more than one interface being used. (4) Change sum or details view quickly: whenever you want the sum view (uploads + downloads) or details view (upload & download) of speed values, just middle-click on the Netspeed icon on the top panel.